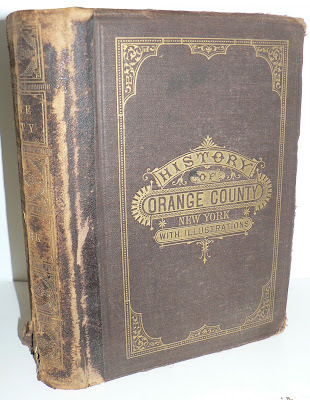 Found in "The History of Orange County, New York" compiled by E.M. Ruttenber and L.H. Clark. 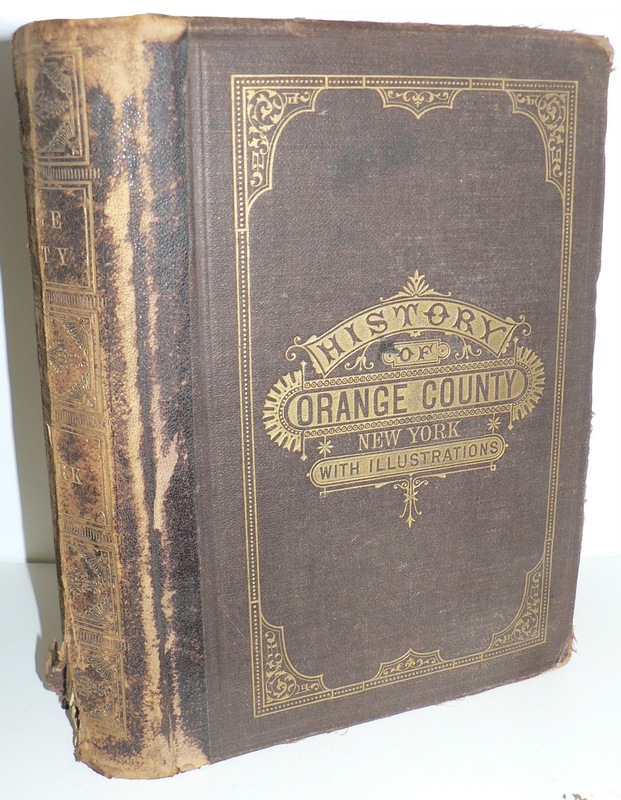 Published by Everts and Peck, 1881. It's hard to tell, but that almost looks like a Victorian "memento mori," or death photo. The photographer would sometimes paint open eyes on the photo, and the boy's eyes look very staring and unnaturally dark. And the hand looks awkward in his lap. I could be wrong, though, because it's kind of hard to see. I agree with katerinajb. I am by no means an expert on memento mori photography, but I do know a little about it and that was my first thought when I saw this photo. His pose is also very slumped and looks unnaturally propped up. The toy in the foreground adds an extra layer of wistful sentimentality. I've never heard of such a thing... I do notice the iron toy at their feet, and after reading the other comments, I'm wondering if it was possibly his favorite toy. He wouldn't be holding it if he were dead. These old pictures are so beautiful to me. This is the first I've heard about Victorian "memento mori". I'll have to do my research on that. @ Mr. Cachet - But is the boy holding the string? Or is the string just looped around part of the chair with his arm draped over there so it looks like he could be holding it... That part of the photo isn't too clear in my view. What a hotbed of speculation! 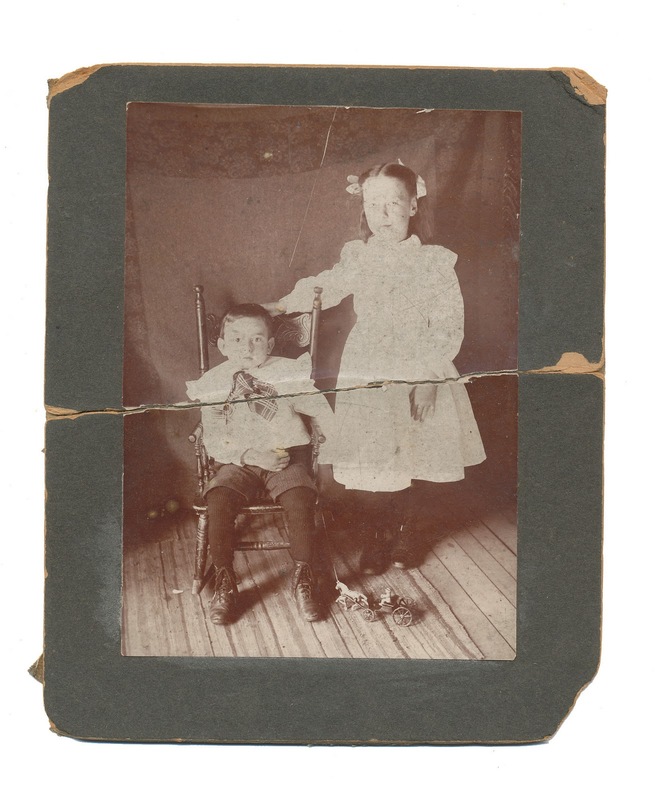 However widely dead children may have been memorialized by photographs imitating life, it seems far-fetched that their siblings would have been roped into the imposture. Fixed stares are common in early photography. Any motion of the head would spoil a portrait because of the long exposure times. Heads were sometimes held by clamps. That an exasperated photgrapher and a wiggly little boy arrived at an "unnatural" compromise pose for the boy to hold requires less supposition, to my mind. Incidentally, Michael, I imagine you can attest that the print was more likely broken than torn, the backing cardboard being quite stiff and brittle. I also had never heard of memento mori, but I looked it up and found that sometimes it was the only photo families ever had of their dead child - how heartbreaking, though creepy to make them look alive. At first, I thought this boy's eyes just looked a little strange but he was alive, but I showed it to my husband, who pointed out that both arms look unnatural and his head looks like it's being held up by the sister. Another question is - if it is a memento mori, why was it in the book? It's an odd choice for a bookmark. I'm definitely not an expert, but I've read a few articles on these, and if you do an internet search for "memento mori," you'll see a lot of examples with other family members--including other children. Sometimes the whole family would be photographed. As another commenter mentioned, this might have been the only photograph the family had. It doesn't seem to have been unusual to photograph the deceased child with his or her siblings (as macabre as it seems now). There may be writing on the other side, but there is a bunch of linen tape obscuring most of the back. I did a little exploratory surgery, but didn't see anything promising. The Victorian era had quite a different relationship with death than we do nowadays. Hair was taken from the deceased and woven into tiny intricate pieces and placed in jewelry to be worn. They kept hair receivers on their vanities to keep hair after brushing then used this for intricate artwork. Thanks, everyone! As a friend says, "You learn something old everyday."